Intrepid television presenter Jeff Stelling will embark on an epic charity walk in March to help tame prostate cancer - passing through Chesterfield on Day 4. Teaming up with leading men’s health organisation Prostate Cancer UK, the long-standing Soccer Saturday host will complete 10 walking marathons in 10 days, from boyhood club Hartlepool United to Wembley between March 21-30. Clocking in at more than 250 miles, Jeff’s Men United March - menunitedmarch.org - will see the 60-year-old check in on 31 football clubs and he will be joined every step of the way by close friend, and Hartlepool United Chief Executive, Russ Green. Setting off from Victoria Park, home of the League Two club, the duo will head south to Wembley Stadium connected by EE, a place Pools have never been. He launched the Men United March live on Soccer Saturday this weekend, at the end of a first person piece on the fortunes of his beloved Hartlepool, the first time he has ever filed a report for the show. “That’s why I’ve signed up for this challenge. I’ve run marathons and climbed Kilimanjaro. There were also some nice fundraising opportunities to go and walk on the Great Wall of China or maybe go to Peru, but they sounded too much like jollies to me. I wanted to do something where people could see I was feeling the pain on behalf of a fantastic cause. Prostate Cancer UK is the Official Charity Partner of The Football League and 25 clubs are represented along the route, through the heartlands of England. He will arrive at Burton Albion on Good Friday (March 25th) and walk onto the pitch ahead of the Brewers’ League One clash with Oldham Athletic. 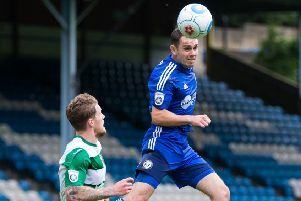 Stelling will also stop off at five Premier League clubs as well as Non-League side St Albans City before an emotional finale along Wembley Way on March 30th. “Walking 10 marathons in 10 days is a remarkable challenge. With each and every step Jeff and those who support him will help us as we tackle prostate cancer head on. “The power of football consistently helps us reach out to men. We are very grateful for the continued backing from Jeff’s colleagues at Sky as well in allowing him to take this on.